This month marks the annual celebration of oceans and all that they contribute to our planet, the surface of which is more than 70 percent water. The National Science Foundation (NSF) has a long history of support for ocean-related fundamental research, and so joins with public and private partners in marking new frontiers in exploring this critical global resource. "Ocean research, infrastructure and education advance our understanding of oceans and ocean basins and their interactions with people and the planet," said NSF Director France Córdova. "Whether it's embedding instruments on the ocean sea floor, studying the impact of ocean acidification, or understanding changes in ocean currents and sea level rise, NSF support will continue to shed light on this critically important part of our global ecosystem." This month, the White House announced their new executive order, Streamlining Federal Ocean Policy and established the Ocean Policy Committee to grow the ocean economy, prioritize scientific research, coordinate resources and data sharing, and engage with stakeholders. A new White House report highlights oceans science research supported by federal agencies. 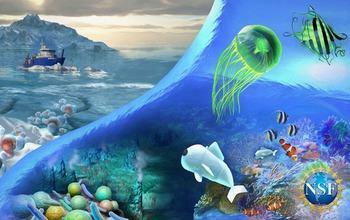 The following are just a few examples of the wide range of ocean research that NSF supports. Unmanned vehicles, whether autonomous or human-guided, offer new opportunities for search and rescue, offshore supply and support operations, ocean sensing and exploration. Deploying a human-robot team can significantly reduce costs, improve safety and increase efficiency. Fundamental research will enable unmanned vehicles to safely perform complex tasks under marine navigation rules, in variable and unforgiving environments, and with intermittent communication. Inundations from storms and tsunamis have caused catastrophic damage to coastal communities and will continue to threaten growing coastal populations and trillions of dollars of infrastructure. With data collected from experiments and post-storm reconnaissance, researchers can understand and model potential damage from ocean forces, designing more resilient structures and coasts. NSF has begun a nearly $60 million investment in Natural Hazards Engineering Research Infrastructure (NHERI), a network of shared, state-of-the-art research facilities and tools located at universities around the country. Ocean waves, tides and currents hold enormous promise as a source of renewable energy. To harvest efficient, reliable and economical ocean energy requires research in fluid dynamics, communications and control systems, as well as the technology to convert the mechanical energy into electricity. Fundamental research can also illuminate system design, site and environmental considerations. To help meet growing demands on limited freshwater supplies, NSF invests in fundamental research for desalination of ocean and brackish waters. Research on a variety of membrane and solar technologies, anti-fouling and anti-scaling methods, as well as low-energy and low-pressure systems will help desalination become more efficient, sustainable and affordable. Better understanding of ocean biology and sustainable fisheries practices will help ensure healthy marine environments and abundant food. Researchers are just beginning to explore the engineering of ocean microbes and algae for food and energy. Marine animals, ranging from sea lions to shrimp, inspire researchers to create stronger materials, more efficient robot motions, more sensitive sensor and imaging systems, and numerous other innovations. NSF is advancing understanding of the Arctic environment, supporting research that will predict rapid, complex environmental and social changes in this region and enable resilience for our world. NSF seeks to help members of the public and the next generation of polar scientists understand these changes. In this way, NSF will enhance the nation's strategic and economic advantages in an international context while safeguarding human welfare and environmental sustainability in the Arctic. Despite its relevance to geohazards, mineral resources and biological diversity, the harsh and dynamic environment of the seafloor and sub-seafloor remain largely unexplored and poorly understood. Research in sensing and communications systems combined with studies of geological, physical, chemical and biological processes will enable new understanding, modeling and prediction of the seafloor environment. NSF is working to chart the future for instrumenting the seafloor for real-time data collection. Fundamental research in fluid dynamics (the flow of fluids) explores many areas, including turbulent flows and biological flow processes. New knowledge in fluid dynamics has implications for ocean energy harvesting, understanding ocean currents and convection, and dispersing oil spills at sea. At the Center for Dark Energy Biosphere Investigation (C-DEBI), researchers use advanced tools and infrastructure to study life under the ocean floor, using specialized technologies like sensor arrays, deep-sea submersibles, scientific drilling ships, remotely operated vehicles (ROVs) and autonomous deep-sea laboratories. Recent analyses by C-DEBI teams suggest that deep-sea microbes play an important role in some of Earth's most basic geochemical processes such as petroleum degradation and methane cycling. Equipped with advanced underwater robotics and an array of analytical instrumentation, a team of scientists will set sail for the northeastern Pacific Ocean this August. The researchers' mission – funded jointly by NSF and NASA — is to study the life and death of microscopic plankton, tiny plant and animal organisms. More than 100 scientists and crew members will embark on the Export Processes in the Ocean from Remote Sensing (EXPORTS) oceanographic campaign. A team of 32 scientists aboard the research vessel JOIDES Resolution affiliated with the International Ocean Discovery Program (IODP) have mounted an expedition to explore Zealandia, Earth's eighth continent. IODP is a collaboration of scientists from 23 countries; the NSF-supported organization coordinates voyages to study the history of the Earth recorded in sediments and rocks beneath the seafloor. The Southern Ocean Carbon and Climate Observations and Modeling project is an NSF-sponsored program focused on unlocking the mysteries of Antarctica's Southern Ocean and determining its influence on climate. In addition to being an enormously biologically proactive body of water, the Southern Ocean drives global ocean circulation, which helps regulate ocean temperatures. NSF's support for innovative STEM education, student research experiences and learning technologies keeps the nation's workforce competitive and prepared for future challenges and opportunities involving the oceans. Research Experiences for Undergraduates (REUs) offer hands-on work to develop ocean current-based electricity. Additionally, NSF has supported access to ocean science education for rural communities and opportunities for students to operate a million-dollar business that makes and sells underwater ROVs at California's Monterey Peninsula College (an outgrowth of the NSF-funded Marine Advanced Technology Education center) and an innovative University of Hawaii teacher training that incorporates authentic science and engineering practices.